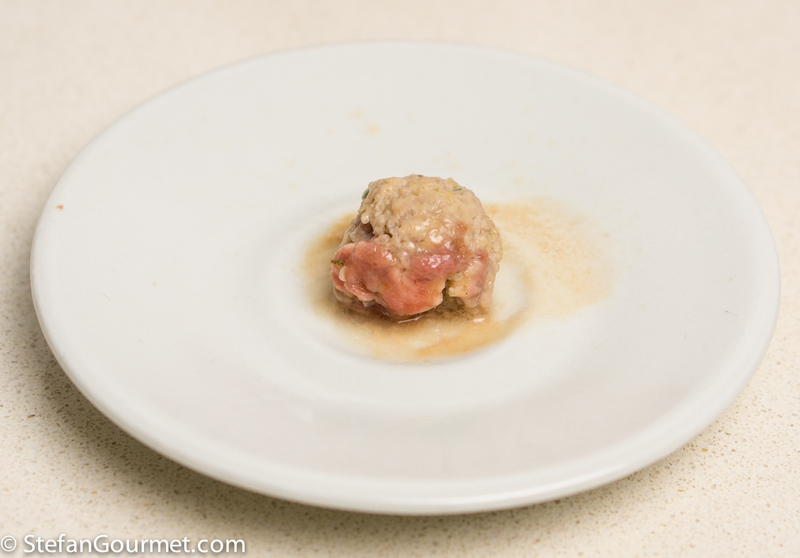 This is an Italian version of what is known in the Netherlands as kalfsvinken: a thin slice of veal stuffed with ground veal. 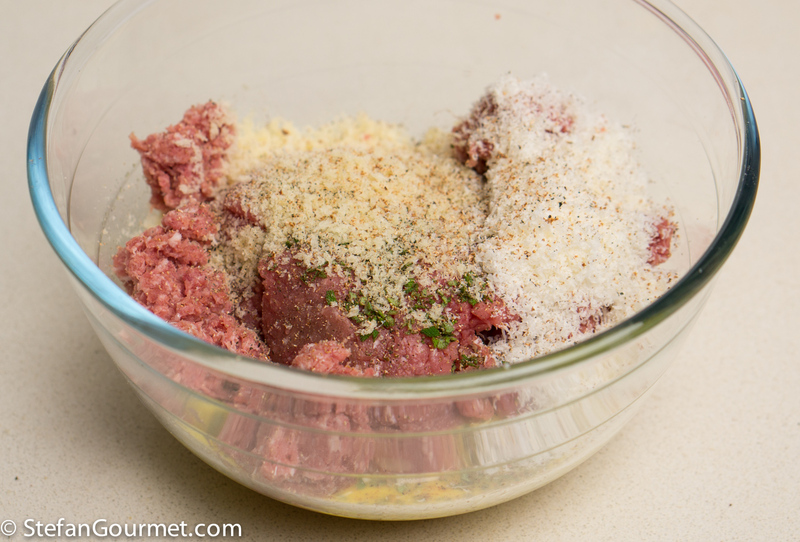 It becomes Italian by the addition of prosciutto, parmigiano, sage, and nutmeg. The easiest way to cook these perfectly is of course sous-vide, but you can just as easily finish them in the oven. The most important part is to make sure the meat does not dry out. 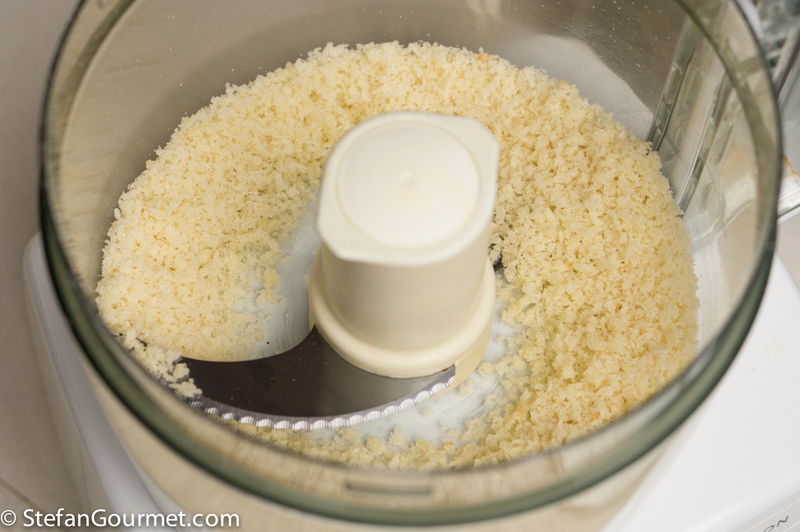 Grind 100 grams of prosciutto in the food processor. 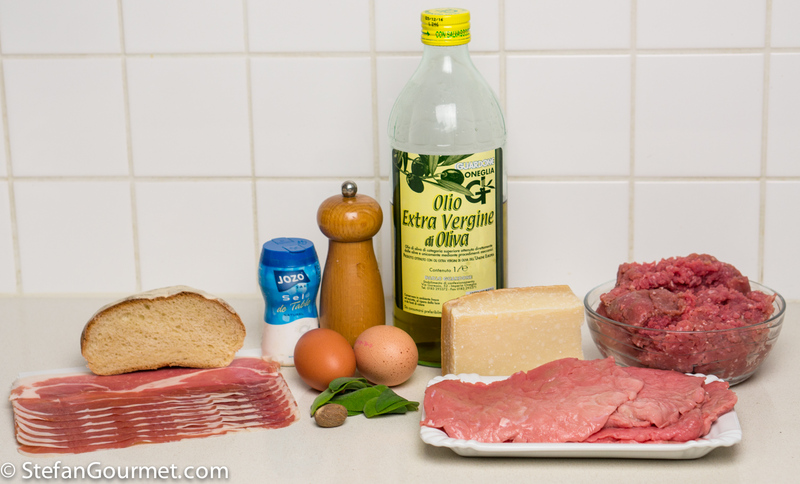 Add 300 grams of ground veal, 20 grams of bread crumbs, 15 grams of freshly grated parmigiano, the ground prosciutto, a dash of freshly grated nutmeg, a tablespoon of minced fresh sage, salt, and freshly ground black pepper to the bowl with the eggs. 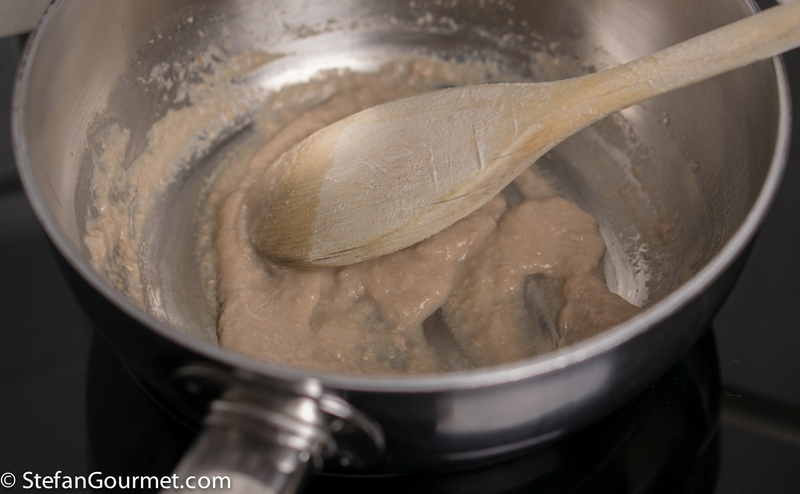 Mix with your hands until the mixture is homogeneous. 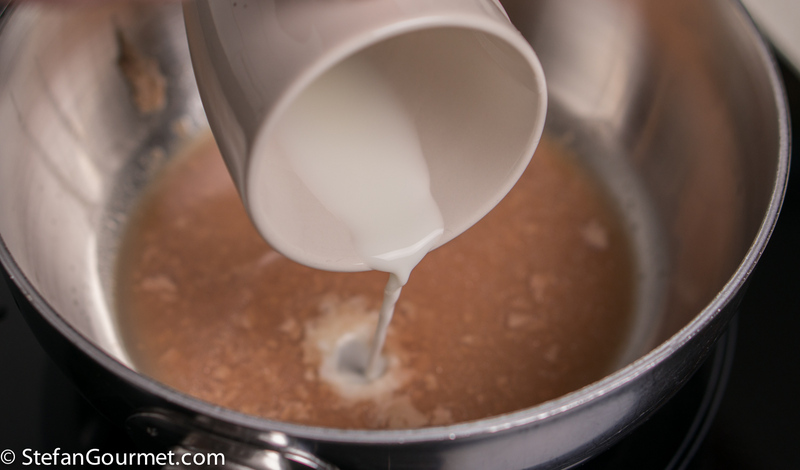 Take a small ball of the mixture and cook it quickly (e.g. in the microwave) to taste the seasoning, and adjust it if needed. Pound 4 slices of veal thin, if needed. 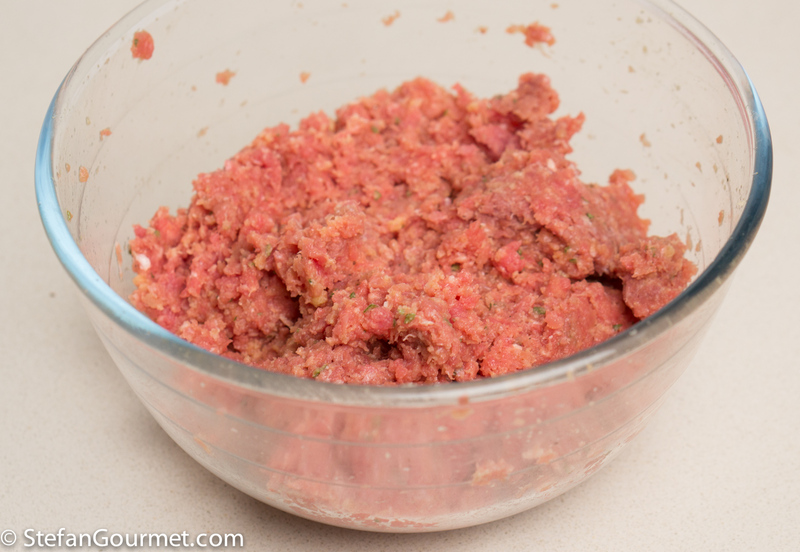 Divide the ground veal mixture into four equal portions and shape them into a fat sausage. 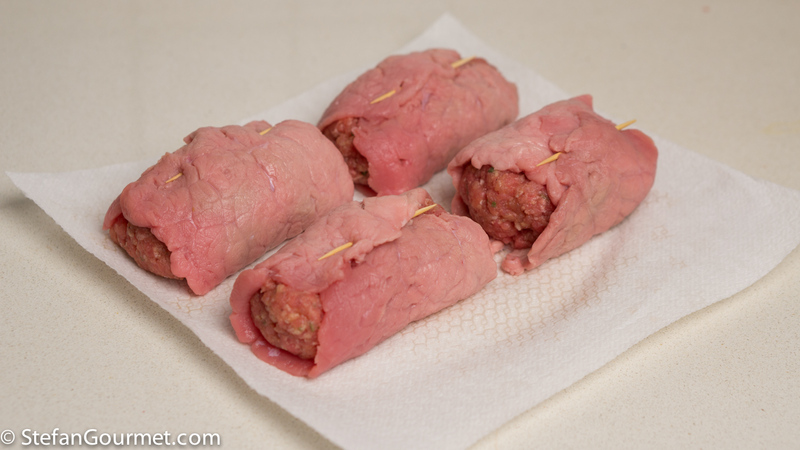 Wrap a slice of veal around each ‘sausage’ and secure with a toothpick. It is okay to see the stuffing from the side. 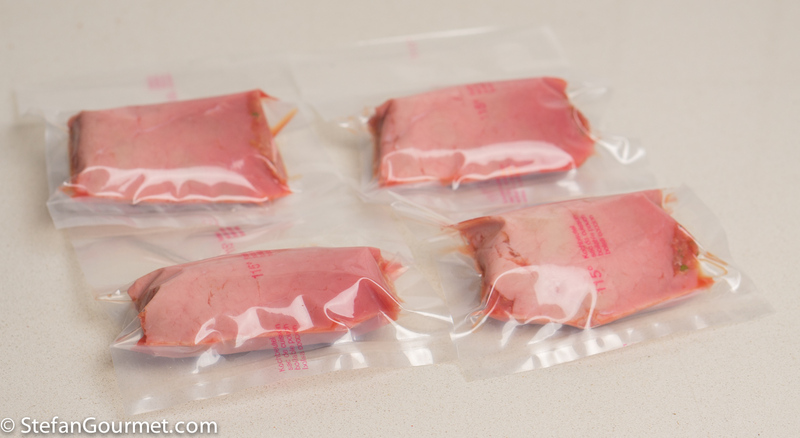 If cooking sous-vide, vacuum seal them individually (or spaced in one large bag), and cook sous-vide for 3 hours at 55C/131F. 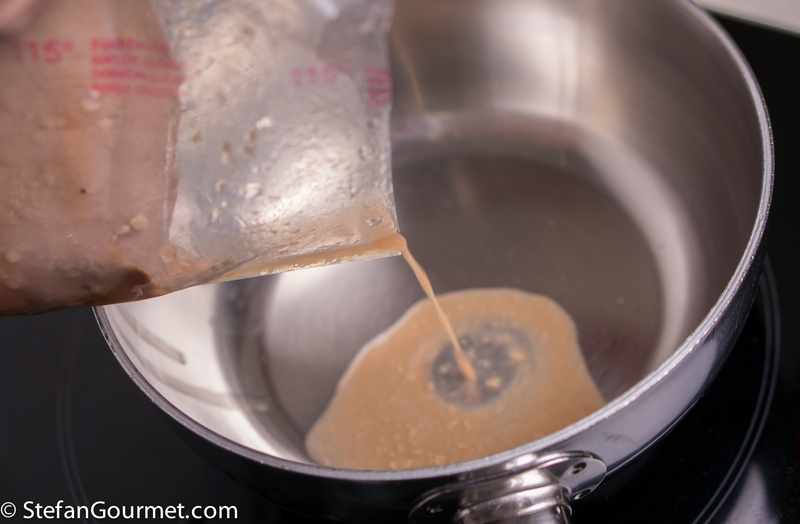 After cooking sous-vide, cut open the bag and pour the juices into a saucepan. 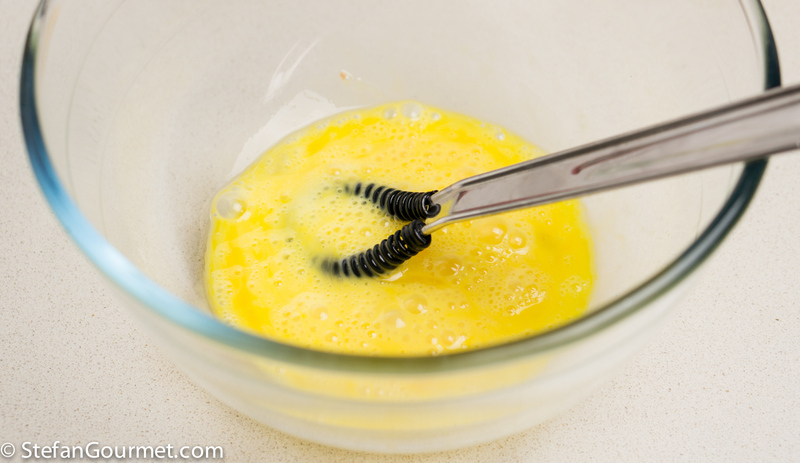 Mix a teaspoon of corn starch with about two teaspoons of cold water, stir well, and add this slurry to the juices. 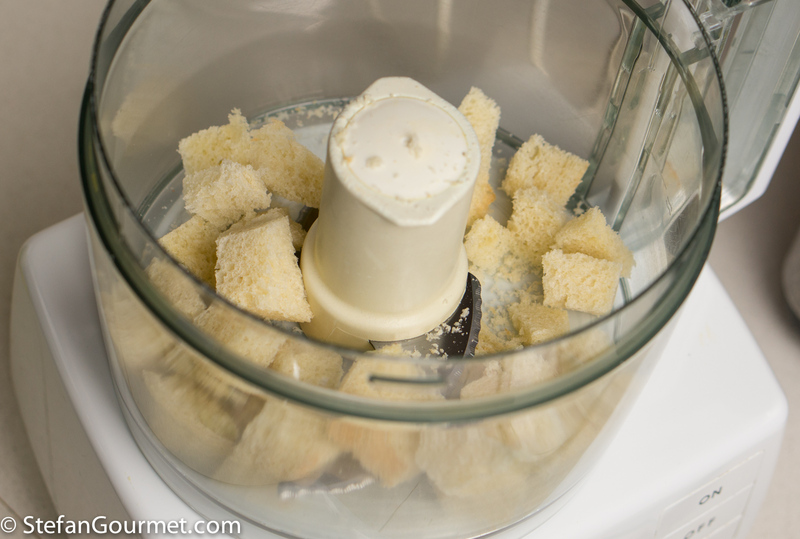 Pat the veal bundles dry with paper towels. Brown them in a frying pan in olive oil until they are golden. 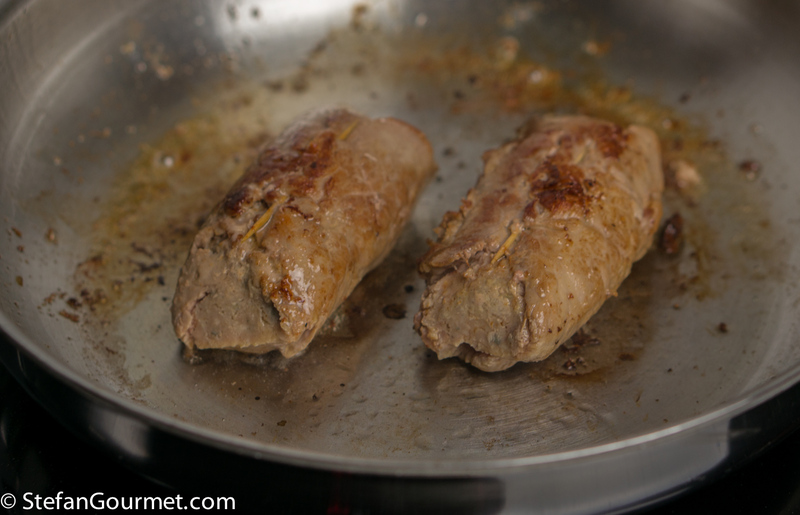 Take the veal bundles out of the frying pan and keep them warm by wrapping them in aluminum foil. 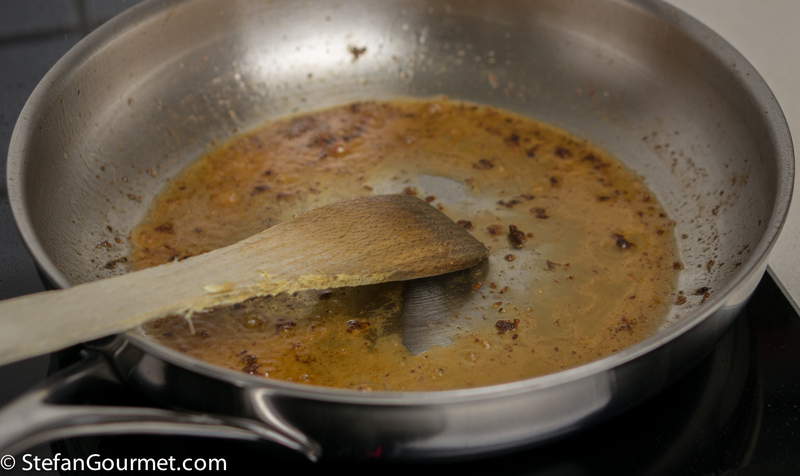 Deglaze the pan with 60 ml of dry white wine. 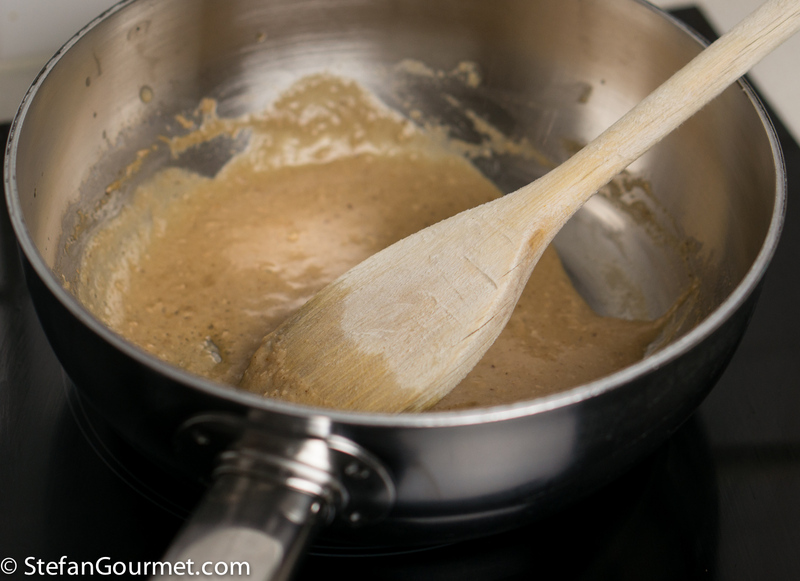 Scrape with a wooden spatula to get all the browned tasty bits. 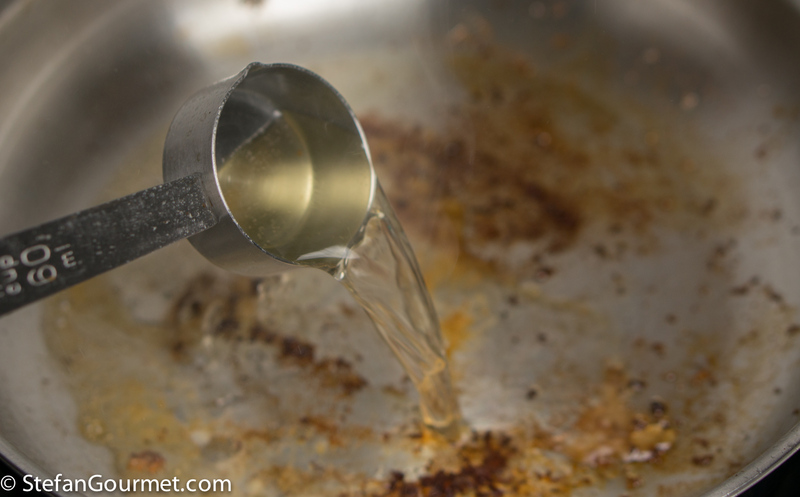 Sieve the sauce from the frying pan into the saucepan with the bag juices. Cook over medium heat, stirring, just until the sauce comes together. Taste and adjust the seasoning. 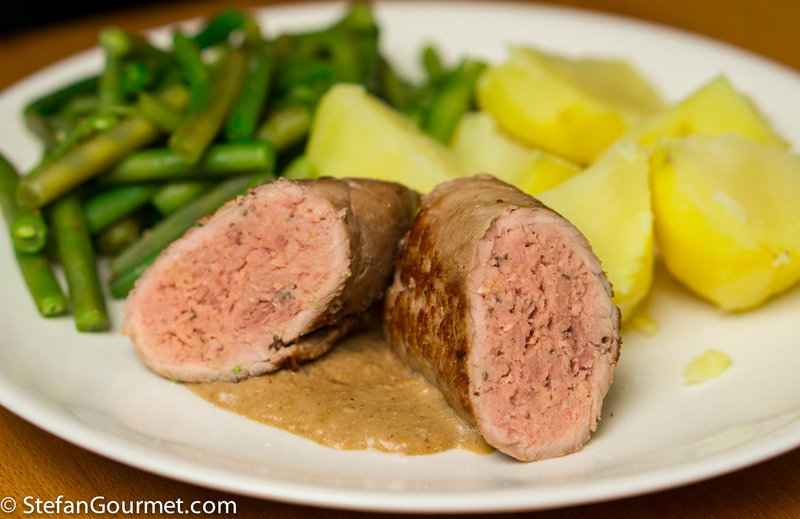 Serve the veal bundles with the sauce on preheated plates. I served boiled potatoes and steamed green beans on the side. This is nice with either a full-bodied white, such as a barrel-aged Verdicchio dei Castelli di Jesi, or a light red, such as a Barbera d’Asti. 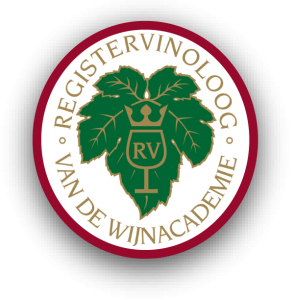 There are also light Verdicchios and full-bodied Barberas, so make sure you select the appropriate style. 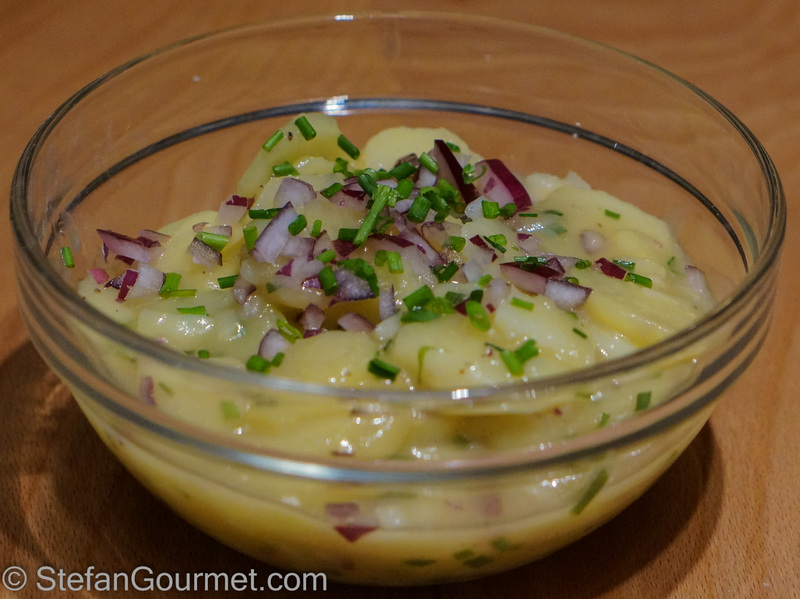 This potato salad from Vienna is one of the most visited recipes on the site, and with good reason as it is delicious. The special thing about this kind of potato salad, is that it is made with beef stock instead of mayo. Sous vide seems perfect for this dish. Thanks — I’d have to see if winter squash is available here. Acorn and butternut are the most common. My favorite is kabocha, which tastes almost like a sweet potato and has a very creamy texture. Squash are apparently low carb, but they taste amazing roasted, as good as a potato! These look incredible. Perfect for the sous vide. 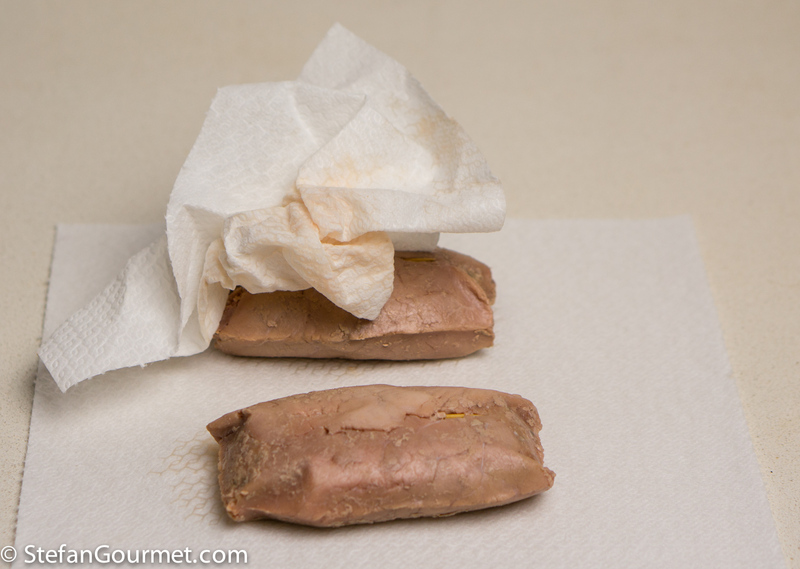 I’d never thought about it before but I guess one could sous vide meat “loaves” as well. 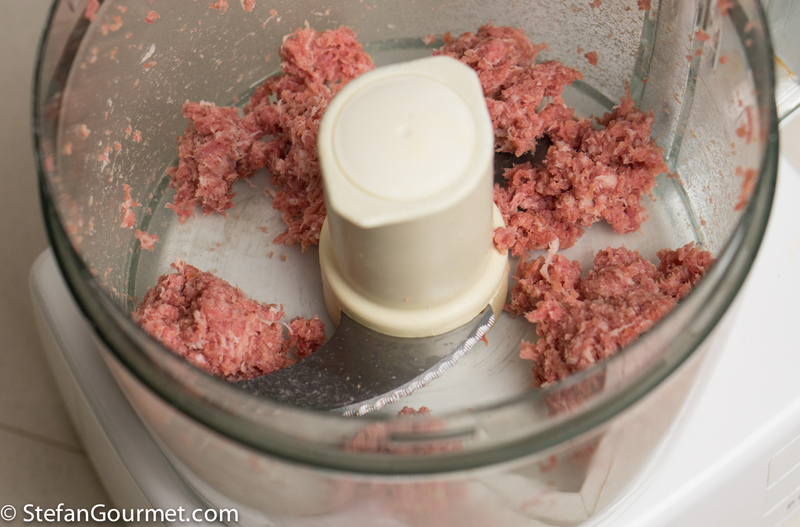 I don’t think meat balls could be vacuum sealed well. I might have to try it! 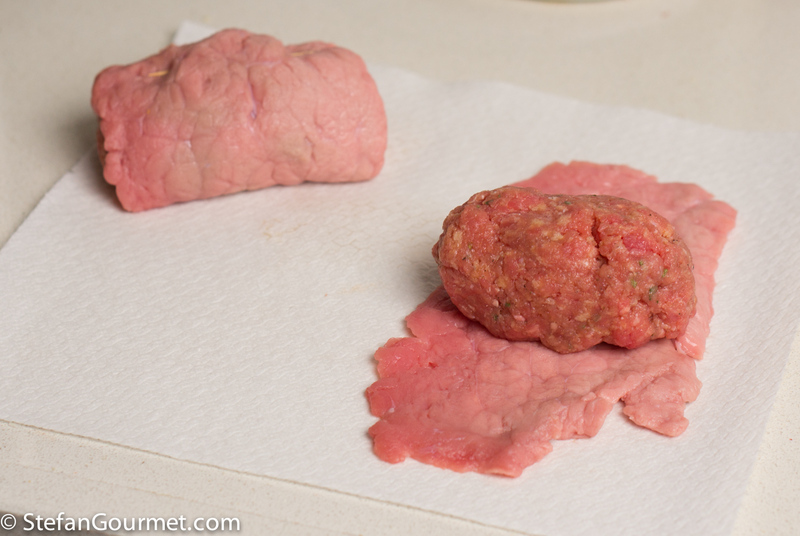 It is possible to vacuum seal meat balls, but they may get visible ‘seems’. 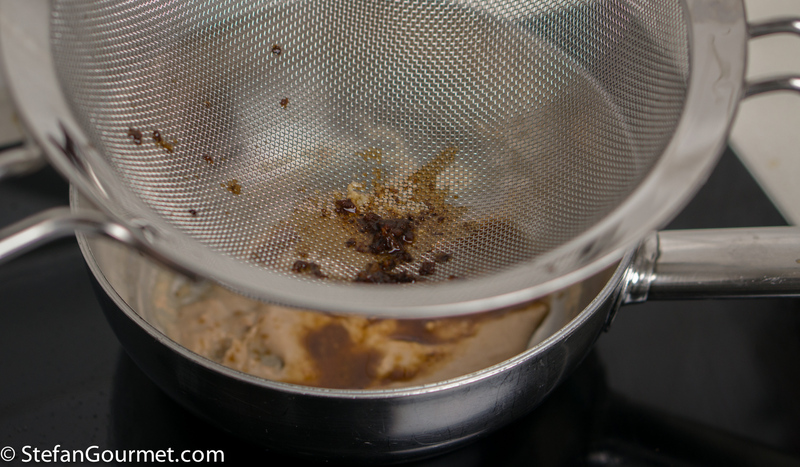 It helps to manipulate them from outside the bag with your fingers after vacuum sealing. I hope your back is better – there’s nothing worse. Good! I have had something similar happen out of the blue, and I thought my life as I knew it was over. Very scary. Hai ragione a dire che il più grosso problema con gli involtini è quello di mantenere la carne tenera e non asciutta. Da provare il sottovuoto allora. Grazie! They look so very tender, I’m sure sous vide is the better method for this. I saw Mimi commenting about your back. I do hope it feels better soon. I went through a month of back pain and was miserable. Thanks, Kathryn. The pain is not in my back but in my left leg (although the problem that causes the pain is in my back). It is a lot better, but not completely gone yet. At least I can do almost everything again — except for running, jumping, and the like. My mom used to make these all the time but the meat inside wasn’t ground: just prosciutto and cheese, rolled in the veal. I adored it. Now I don’t eat veal any longer. The more meat I scale back the more I find ethical reasons not to eat living things anymore. Ok, will shut up now.